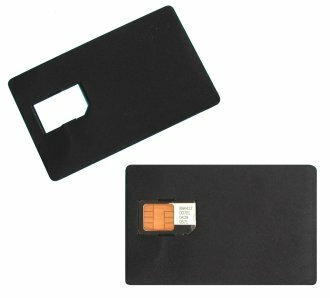 The budget SIM adapter card is a low-cost solution to temporarily convert a small SIM-sized card to a full size one, allowing it to be compatible with a standard smartcard reader. The adapter is made from a single piece of molded plastic that neatly holds the SIM in place while it is inserted into the reader. It can be used for both one-off fitting into car-phones and for SIM phonebook editing on PCs.